The following video shows how the Realtime Reporting and Captioning Theory is the fastest way for students to start their Reporting and Captioning careers! The CRAH theory is the only theory developed specifically for home study students. It is proprietary to the CRAH program and is not sold to schools or individuals who are not training with the CRAH program. What makes this theory unique is that it correlates a one-of-a-kind studio-produced online video tutorial with each of the 20 theory lessons. So learning the theory is like having a reporter sitting next to the student, mentoring the student, while he learns each of the 20 theory lessons, unlike other theories requiring an instructor in the classroom. This theory was developed so it could be SIMPLIFIED for online students, containing only 20 theory lessons, while still meeting the requirements for captioning, CART providing, and court reporting. The CRAH theory manual is printed in color, allowing the student to recognize immediately new material introduced in each lesson printed in red, important notes to the student printed in blue, and other colors designating different information. The easy to understand lessons make it possible for the student to proceed through the theory lessons with little or no assistance. However, while the student is training at his home with the online video tutorials, he is never alone, as he has a Support Department available to assist him. The online video tutorials demonstrate everything a student would learn in a formal school setting, including how to attach the tripod to the steno machine, proper posture, correct finger placement, as well as illustrating how to write each of the 20 theory lessons. Each of the 20 theory lessons contains an online audio drill dictated for each lesson and a review of the material presented in the prior lesson. 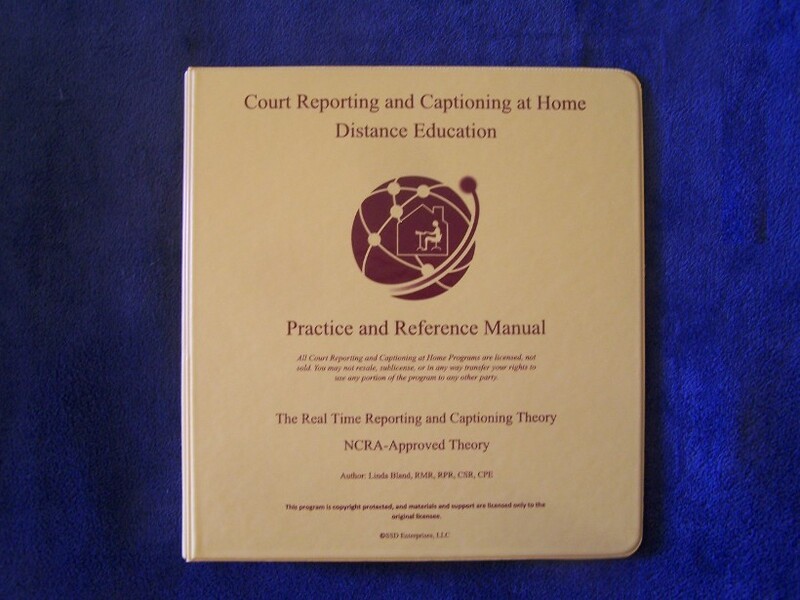 As a former court reporting student in a traditional school that closed after 6 months into my training, I decided to switch to the Court Reporting at Home Theory, as I had difficulty memorizing the old theory, because the instructor consistently made changes to the theory book. Linda’s method from start to finish is fantastic. 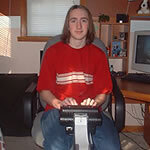 From the very beginning learning the proper way to set up my writer has made a tremendous difference! Linda’s method of training syncs right in line with how I learn. I can’t wait to continue this journey and feel extremely confident. I’m excited about continuing this training. The CRAH theory contains a reasonable number of brief forms, also referred to as arbitraries in the CRAH theory, which are shortcuts for writing the most commonly heard words and phrases. There are literally thousands of brief forms/arbitraries that could be introduced, but one can only remember a reasonable number of them. Based upon the theory developer’s 30 years of reporting experience and realtime writing, she included the most important ones. The CRAH theory allows individuals to add brief forms/arbitraries to their theory if they choose, so long as they do not conflict with any other steno outline. However, for purposes of realtime writing and captioning, realtime writing concepts are the foundation for this theory. “Realtime Writing and Captioning Theory” offers the student optional methods of writing in steno in many cases, allowing them to utilize the method of writing that is easiest for them to remember and write. No two students learn realtime writing the same. Therefore, offering students a theory that allows them options may ensure a student will complete his training. The “Realtime Reporting and Captioning Theory” is a simplified theory containing 20 theory lessons in hard copy in the Theory Manual. A Practice and Reference Manual is coordinated with the 20 theory lessons and contains answers to the review quiz presented for each prior lesson, lists of brief forms/arbitraries presented lesson by lesson as well as alphabetically, a Weekly Planner to monitor the student’s progress, and a steno machine keyboard chart. In addition to practice dictation for each theory lesson, there is a short written test covering each of the 20 theory lessons. Once the student can write and read back the audio dictation for each lesson, the student takes the short written test to ensure he has mastered the material introduced in each lesson. At the completion of the 20 theory lessons, the theory is supported with audio CD and DVD dictation to refine the student’s theory knowledge and build speed. This consists of audio dictation in the three categories of literary, jury charge, and testimony or Q&A (question and answer) dictation from 60-225 wpm for testing purposes, and 60-260 wpm for practice dictation. There is also supplemental dictation for medical terminology and names and numbers practice. If the student requires any assistance with any lesson, CRAH has a Support Department comprised of professional, credentialed professionals to assist the student with each lesson. The CRAH theory is also accompanied with a free, prebuilt steno dictionary containing 35,000+ entries which will translate approximately 50,000 words and which may be utilized in conjunction with any computer aided transcription (CAT) software. I completed my theory in 5-1/2 weeks and passed my 60s through 140s in 3-1/2 months! I love the CRAH program! It is the only theory correlated with online video tutorials, like having a reporter/mentor sitting beside you while you learn. With the online tutorials and professional Support Department, the student is never alone. The student never has to wonder if he is learning the lesson correctly. The theory lessons were so simple and put together so well, I was able to complete theory in 2-1/2 months while working full time! It is as simplified as a theory can be, and still be on the cutting edge of computer aided transcription technology. Other theories read like technical manuals and do not hold the student’s interest. The Realtime Reporting and Captioning Theory is motivational, fun and students make progress in every practice session! I am so happy to have found CRAH! I was at my wits end. I was going to the only court reporting school in my state, and the theory was new to the school and delivered so poorly that in the two semesters that I attended, I didn’t even learn the whole alphabet. This theory was all briefs (memorization), and it looked like rocket science. There wasn’t even any audio practice dictation! Some of the students had been there for seven years or longer with huge student loan debt, and the drop- out rate was very high! I didn’t want to be that student. I began searching for an alternative. Next, I purchased a theory that had CDs and a book to practice. This theory was long and convoluted, and there was no one to ask or answer my many questions. It had no support. I looked again and found CRAH. I spoke with Linda at least three times before I finally bought this system. I had to unlearn everything that I was “taught,” and then CRAH began to make sense, and then it really started to click! My family and I are so happy with my progress, and we now look forward to the future. I can actually see myself doing this job and enjoying every minute of it. CRAH believes that I can do it also. My Support Department answers every question in a timely manner, and the materials are full of encouragement. The online video tutorials shows everything they should have taught me in the traditional school that I attended. I would recommend this program to anyone who is interested in training for court reporting, captioning, or CART providing. If you have the discipline and work hard, you will succeed. I know I will, and CRAH will be there for me every step of the way. I was amazed how simplistic the lessons were and how quickly I was learning and progressing. I completed theory in roughly four months and passed the first four speed levels (60-120 wpm) in the next four months all while still in high school. LIFETIME Internet support from credentialed court reporters, captioners, or CART Providers ensures you make progress each time you practice. CRAH theory is color-coded for ease of practice and has a unique concept developed specifically for online training. Many of our students who have not had prior training have learned the entire theory in 5-6 weeks to 2-3 months, allowing them to begin speed building in a matter of weeks or a few short months! The CRAH “Realtime Reporting and Captioning Theory” has been thoroughly thought out and is very easily understood. I had no trouble getting through it in 2-1/2 months. The majority of theories were developed to be taught in a traditional school setting and were not developed for online training. If you’re interested in a career in realtime court reporting, closed captioning, also known as broadcast captioning, and/or CART Providing, one of the most important considerations in deciding how you are going to train for these careers is choosing the theory you will learn. The REALTIME COURT REPORTING AND CAPTIONING THEORY is the FOUNDATION FOR ALL YOUR TRAINING. Theory is the method in which students are taught to write on the steno machine. 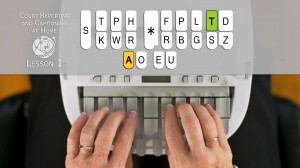 Theory means learning where all the keys are located on the steno machine, learning combinations of keys that, when depressed simultaneously, denote a letter of the alphabet. The differences in theories arise in the number of shortcuts for writing words and phrases (known in the industry as briefs, brief forms, or arbitraries) incorporated in each theory, how the theories teach you to write punctuation, numbers and spell utilizing individual letters. 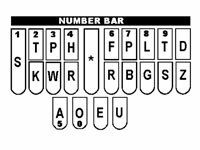 Below is the steno machine keyboard. We write both phonetically as well as the way the word is spelled when possible. CRAH theory is presented in such an efficient and organized manner that it is extremely easy to learn. The DVD tutorial illustrates everything from how to set up your steno machine to how to write each of the 20 theory lessons! The Real-time reporting theory is incredible. It makes so much sense. I practice/study 2-3 hours a day. I was a court reporting student 20 years ago, and unfortunately at that time I attended a really terrible school. The theory they taught was not computer compatible at all. Sometimes there are obstacles for me. I remember some of what I learned to write in the past. And at times I think, “Oh no, I can’t write that, that way.” However, I keep practicing it, and it comes quite easily through persistence of purpose. I am happy to report I completed the CRAH Realtime Reporting and Captioning Theory in 6 weeks. Yay! That’s in 6 weeks all total excluding for the holidays and illnesses around Christmas and New Year’s. This theory never ceases to amaze me and keeps me motivated. I was only practicing about 30-45 minutes a day but it was enough for me, since I got through the whole theory book in 6 months, which was my goal. As a former court reporting school owner and former Director of a court reporting program at a state university, I want to take this opportunity to congratulate you on the fact that your theory was approved by NCRA. As you know, I recommend your program and theory to students who want or need to learn at home, and I have coached and mentored some who are doing that very thing. They have commented to me that your theory makes sense to them and is, therefore, logical and easy to learn. They have also commented that they like how your theory book is set up and how you present the theory. I certainly agree with these comments, and I can strongly recommend it. I’ve had the opportunity to personally work with Linda Bland and the CRAH program. It is a remarkably thought-out program. 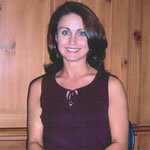 Linda has incorporated her years of experience in creating a program that is understandable and functional. It is an excellent theory. The encouraging support the students get from the CRAH Support Department is wonderful. Students who participate in this program can be assured they will be well on their way to being prepared for the careers of court reporting, broadcast captioning, and CART Providing. I had been a practicing freelance reporter for 24 years, but I had never sat for the RPR exam before, because I didn’t feel I had the necessary speed to pass the exam. I practiced by your practice CDs and test CDs for one month, at least an hour a day, and I was able to sit for the RPR exam and pass all three legs in one sitting with very, very few errors. Thank you so much for all of your hard work and your excellent program for learning court reporting at home. All CRAH programs are LICENSED TO THE ORIGINAL STUDENT for life. CRAH programs are licensed, NOT sold. Components of the CRAH program may not be sold, given, or in any manner transferred to another party. Once CRAH program components are shipped, they cannot be returned for credit or refund. 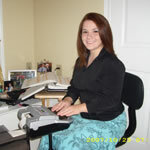 STENO MACHINES are OWNED by the student and may be sold, traded or disposed of in any fashion by the student.